A real slice of nostalgia, this dates from 1973, feels like it, and is all the better for it as well. The most up-to-date thing in the entire show is a single “audience response” shout “what’s your favourite Lionel Ritchie song?” (answer: ‘hello’). And yet, thanks to an energetic cast and imaginative creative team, it still feels fresh. Lovers Brad (A***hole) and Janet (S*ut) break down in the rain, seek refuge in the home of Frank N Furter, and meet his household staff and latest invention Rocky, before the crew return from whence they came. It’s all campy stuff, very much of a time-warp, when such things were outrageous instead of on prime-time television. That we have come so far is something to celebrate in itself, and it’s a fair case that this show (and film version) played a major role in helping acceptance happen. Dom Joly makes a decent guide. His career may be over (‘harsh but fair, Wimbledon,’ he admits) but his narrator is a quick-witted and amusing soul. Opening the show, a dreamy Usherette (Laura Harrison) reminds us of the joys of a “Science Fiction – Double Feature” before the cinema curtain goes back on the cardboard-cutout world (excellent Hugh Durrant set, Sue Blane Costumes). We meet nerdy Brad (Ben Adams, A***hole, as mentioned) and cute Janet (Joanne Clifton, S*ut, again, as mentioned), as well-matched a team as you could find – Clifton in particular in rather good voice throughout. 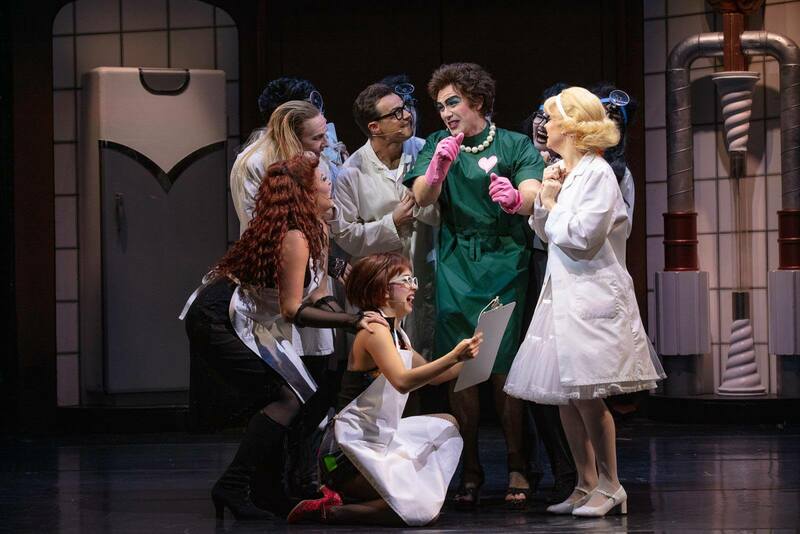 From their first encounter with Riff Raff (creepy Kristian Laverscombe) and strikingly frenetic master Frank N Furter (Stephen Webb, charming underclothes) it’s mostly roaring fun. Lovely support work from Magenta (Laura Harrison again) and a beautiful bit of fun in the second half by Columbia (Miracle Chance), rightly applauded. Rocky (Callum Evans) is a vision in leopard-print, while Ross Chisari makes the most of both Dr Scott and Eddie. Notes too for Reece Budin, Shelby Farmer, Katie Monks and Jake Small, Phantoms who add greatly to the big numbers when required. 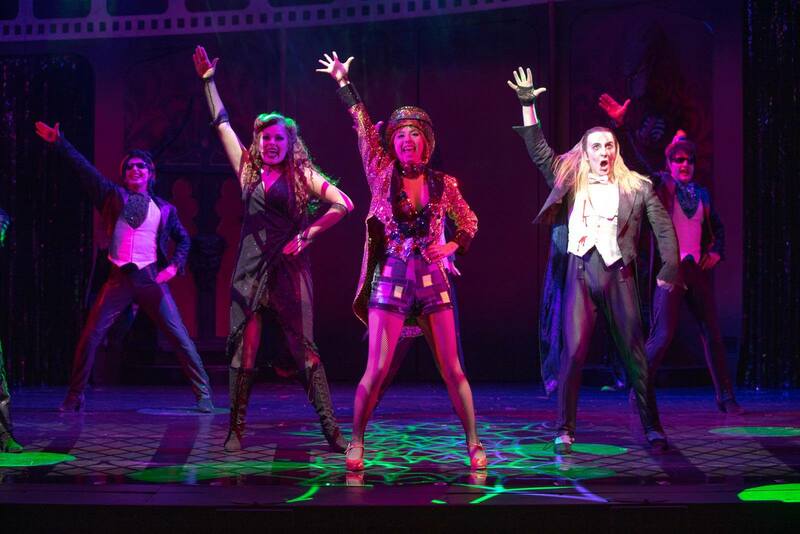 Sure, the music isn’t always the most memorable – “The Time Warp,” “Touch-A-Touch-A-Touch-Touch-A-Touch-Me,” “Sweet Transvestite” and “Hot Patootie” remaining the mainstays, and the plot is thinner than Janet’s slip, but the script still has its moments and they are greatly enhanced by those who know when the audience chimes in. If it comes your way and you’ve never seen this little piece of British musical theatre history, try to. More significant than the frivolity makes it appear, it’s for the broader-minded and shows just how many more broad-minded folk there are now. A milestone that deserves support and recognition for all it does. Photographs by kind permission of the New Wimbledon Theatre. Thanks Sadie. You must have been in the crowd going in as I was in the crowd going out. Good fun and well done on your own blog write up – and total bravery not knowing a thing about the show before you went in. I’m impressed :). Great to chat. Best, Steve. Very glad to hear Rocky Horror still wearing well. As I have already mentioned elsewhere, I came to it rather late in the day but thought it was a brilliant show that occupied its own world in the way that ‘The Boy Friend’ does, for example – it kind of defines its own genre and yet stands alone therein. Long may it continue to bring pleasure to theatregoers of all ages! It really is in fine form, Tony :). Yes, it really does have its own space, there’s nothing like it. Come to think of it, as Richard O’Brien is originally from New Zealand, I think it is probably the most successful New Zealand show ever?! I hope it tours for years, and I hope this version comes London way again some time, too. Are there any other New Zealand shows? But then Richard O’Brien only acquired New Zealand dual citizenship in 2011 because he was born in Cheltenham and emigrated to New Zealand when he was 10, according to Wikipedia. I probably mentioned elsewhere that in 1973 or so, Richard’s then wife Kimi Wong was starring as Aladdin in the Aba Daba pantomime at the Pindar of Wakefield for which I was playing piano and Richard used to come along to collect Kimi most nights towards the end of the show and stand at the back of the room where his unmistakable bald head could be clearly seen above the audience. So Richard has attended more of my live performances than I ever have of his. LOL! I think they tried two recently and both flopped according to “The Stage.” I thought he was NZ totally, how interesting he’s in fact a Brit!